Alyson Laura: Evolve human success and planetary delight. Daniel Dreher: Accelerating human sustainability, evolving culture & community in the built environment. 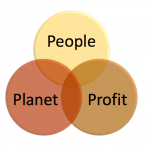 The history of sustainability began in the early 90’s with the introduction of the triple bottom line – People, Planet, Profit. Sustainability is primarily a reaction to the Business As Usual (BAU) approach to development, also known as ‘Degenerative Design.’ The importance of sustainability solidified under the formation of the Millennium Development Goals (2000) created by the United Nations. By 2009, the LEED rating system approached peak market saturation and ‘do less harm’ became the mantra of legions of ‘green’ professionals. This evolution of sustainability was then expounded upon further with the UN’s Sustainable Development Goals (2015). 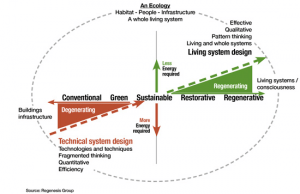 The Leverage Point Continuum depicts how building design and construction ranges from degenerative design to regenerative design. Daniel looks at the left side as scarcity mindset and the right side as abundance mindset. We can shift into the right-side within culture and community. Sustainability is the leverage point, and the goal is to fall to the right of the leverage point into restorative and regenerative design. 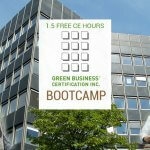 Take a strategy that pushes your building project towards regenerative design and submit it as an innovation credit! Daniel dealt with the devastation of Hurricane Katrina firsthand, and was working on a LEED project, the student center for Tulane University, when the storm hit. The basement of the project quickly filled with 9 feet of water. His company had over 100 buildings that were affected throughout New Orleans. 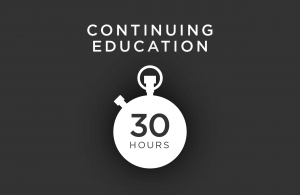 Through heroic efforts and stakeholder support, they were able to get the campus up and running for the next semester. Hurricane Katrina caused a huge host of issues regarding resilience. It exposed chronic stresses, namely equity issues. However, the people of New Orleans embraced the idea of resilience during the rebuild. In the article Finding Solidarity in Disaster, Jacob Remes notes that the “looters” were actually groups of people who broke into abandoned stores to salvage food, water and clothing for those who were in need in the community. “Such responses to disasters reveal an alternative vision of how to organize society: with ordinary people banding together to help rescue each other and rebuild their communities,” said Remes. In fact, it is a common occurrence, proven by decades of disasters, that immediate response to disaster is created by local people helping each other. In 2008, a tornado struck downtown Atlanta. At the time, the city did not have a resiliency plan. Similar to the efforts of the community of New Orleans, residents of Atlanta offered their services that the municipality couldn’t do immediately. Luckily, Atlanta now has an Office of Resilience and Atlanta is now one of the 100 Resilient Cities pioneered by the Rockefeller Foundation. The office has propelled a lot of government and business conversations about resiliency throughout the city. It is working! From the brand new LEED Platinum Mercedes-Benz Stadium, the most sustainable stadium in the world, to the City of Atlanta’s “Grow-A-Lot” campaign, promoting the growth of urban agriculture. Do you see resilient design in your city? 66% of live respondents said there is resilient design in their cities! Antifragile is about resisting the shocks, and getting better – NOT staying the same. It’s 100% about evolving. This is not a new concept. First introduced by Nassim Taleb in 2005 with the novel Antifragile: Things That Gain from Disorder, antifragile applies to an entire spectrum of things that resist and grow when encountered with unforeseen and unwelcome stimuli. To understand this concept, think of Robert Moses, acclaimed city planner for NYC, versus Jane Jacobs, the journalist and author who argued that Moses’s plan for urban renewal would hurt the community instead of help it. Robert Moses concepts of city planning were fragile and degenerative, while Jane Jacobs’ motives were fueled by antifragility. Read more about the battle over New York’s city planning here. Brian Johnson took Taleb’s concept of antifragility and applied it to human beings. Below is a diagram from his program, Optimize +1. He helps you optimize yourself to make the best version of you! 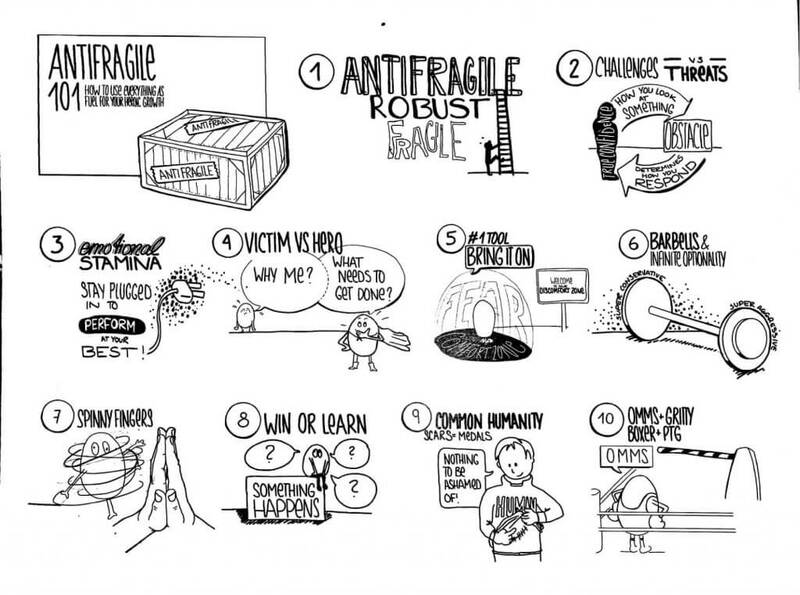 How can you become more antifragile in your own life? Regenerative Design is NOT codified, and there are NO best practices. Regenerative Design emulates how nature works. It starts with how you approach design. Regenerative design is not biomimicry nor biophilia as it does not copy nature nor surrounds itself with facsimiles of nature. At the core of regenerative design is avoiding compromising the needs of non-human beings, such as wildlife, and natural resources. 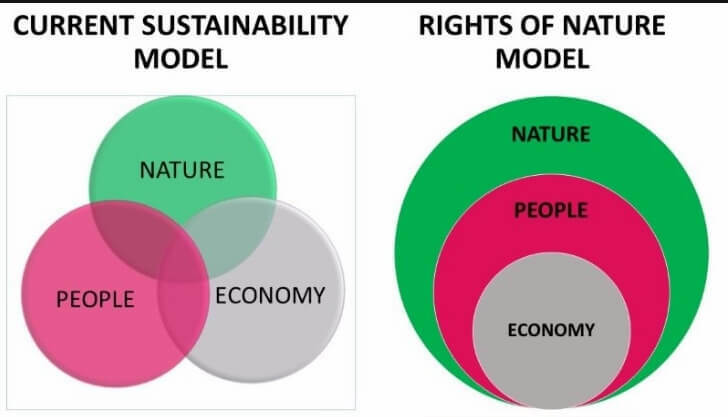 As shown in the Rights of Nature Model, our success of the economy is 100% dependent on the antifragility and resilience of nature. Read more about how nature’s rights can be incorporated in design in the Regenisis Group’s Regenerative Development and Design: A Framework for Evolving Sustainability. 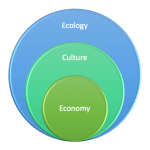 Move away from the triple bottom line and into the rights of nature. Need some inspiration? Listen to Charles Eisenstein, Author & Philosopher share why the Earth is still dying from a thousand small cuts. For more voices on the Future of Sustainability, check out this panel discussion to learn from the visions of industry leaders.